Home-sales data from February show median home prices smashed records in Seattle and the Eastside. 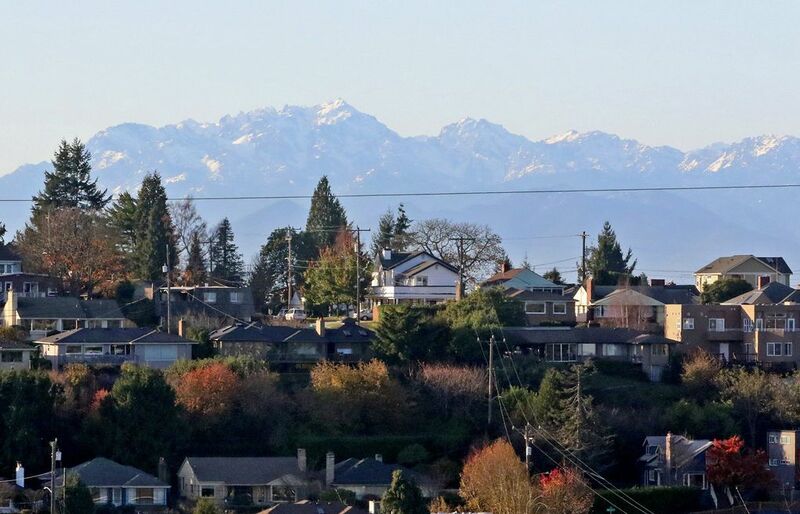 Hopeful buyers won't have much luck elsewhere as median home prices grew at least 15 percent in every Puget Sound county. 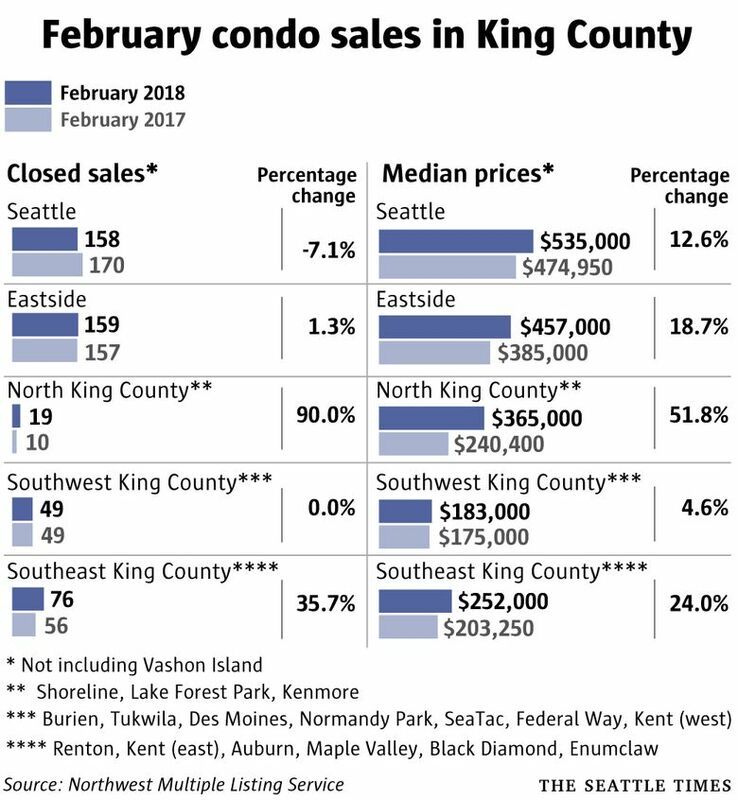 Both Seattle and the Eastside again have smashed home-price records as the region’s housing market continues to be brutal for homebuyers even before the peak spring season kicks off. 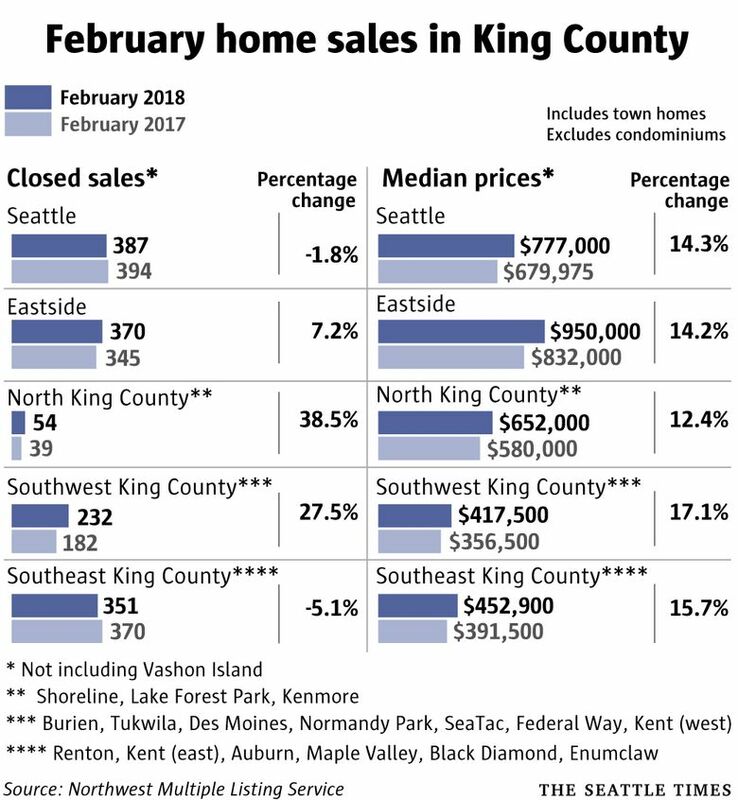 New monthly home-sales data released Tuesday showed Seattle’s median single-family-home price hit $777,000 in February, $20,000 more than the previous all-time high set just a month prior. On the Eastside, the median cost of a house was $950,000, or $12,000 more than the peak price from two months ago. And yet there is little escape for people priced out of the region’s most expensive markets. Home prices grew at least 15 percent in every county in the Puget Sound region, according to the Northwest Multiple Listing Service. Both Snohomish and Pierce counties set a record high for home values, even though prices historically have lagged in the winter. “The hyper job market in the Pacific Northwest continues to outpace almost every metro area in the nation, and thus our housing market is booming; for now, there is no end in sight,” Mike Grady, president and COO at Coldwell Banker Bain, said in a statement. And it’s not just houses: Condo prices surged 22 percent from a year ago in King County. For the first time, the median cost of a condo in Seattle surpassed half a million dollars. The typical Seattle condo now costs $535,000, up $60,000 from a year ago. While incomes locally have begun to rise significantly, home prices are still increasing much faster, as they have for the last half decade. The cost of a home locally has roughly doubled in the last six years and is up 50 percent over the bubble-era high in 2007, making it much more difficult for even financially responsible, middle-class people to buy their first home. A quarterly survey from real-estate company ValueInsured, released Tuesday, found just 25 percent of millennial renters in Seattle were confident they could afford a down payment on their first home. It’s easy to see why: Compared with a year ago, the typical house costs about $100,000 more in Seattle and an extra $118,000 on the Eastside. With a 20 percent down payment, home shoppers would need to have saved up at least $20,000 in the last year just to avoid falling further behind. The local survey size was small — over 200 respondents, but is generally in line with past polls and data showing millennials being priced out of the home market. The firm’s national survey, which was much larger, found 35 percent of millennials were confident they could buy their first home. Perceptions of the real-estate boom also depend on where you stand. The survey found 21 percent of Seattle’s millennial renters said the local housing market is “healthy,” compared with 76 percent of homeowners of all ages. Looking across the metro area, the region’s home prices have grown faster than anywhere else in the country for the last 16 months in a row. And price increases statewide continue to exceed any other state. 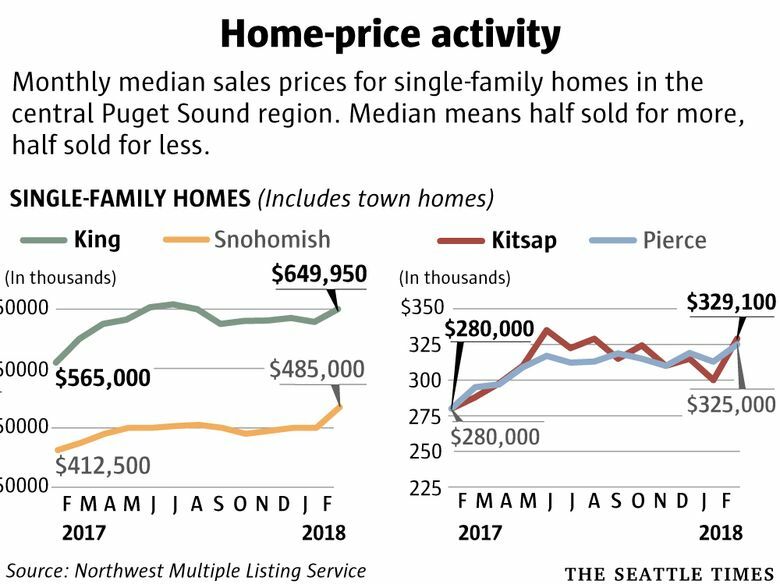 In Snohomish County, home values jumped 17.6 percent to a record median price of $485,000, more than the old high mark of $455,000 from last fall. In Pierce County, prices increased 16.1 percent to $325,000, beating the record of about $320,000, set two months ago. In Kitsap County, costs surged 17.5 percent, to $329,000 (behind the all-time high of $335,000 set last year). Home prices jumped the most in the Kirkland-Bridle Trails area — up 40 percent in a year. They also increased more than 30 percent in both Juanita-Woodinville and Sodo-Beacon Hill. On the other end, prices dipped a bit in West Bellevue — the region’s priciest market — and in Renton — Highlands/Kennydale. As has been the case for years, the number of homes for sale continues to decline, making the real-estate market even more competitive and helping to drive up prices. Total listings on the market in King County dropped 5.1 percent from a year ago. That decline was actually the smallest in years — it’s become common for inventory to drop 20 percent or more, year-over-year. The number of new listings introduced last month actually ticked up a bit from a year ago, a trend homebuyers will hope continues as the peak spring homebuying season nears. Robert Wasser, a board member for the multiple listing service and owner of Seattle-based Prospera Real Estate, said to expect prices to continue to rise until at least summer. There’s another less-noticed but significant trend putting a damper on affordability: rising mortgage-interest rates. Interest on home loans had been historically low throughout the recent surge in home prices. But they’re at their highest point in at least four years after creeping up over the last couple months. The average 30-year fixed mortgage in Seattle was 4.3 percent Tuesday, up from 3.8 percent two months prior, according to Zillow. The increase adds about $180 to the monthly payment on the median Seattle home, or an extra $65,000 over the life of a 30-year loan. Some housing experts fear rates could hit 5 percent by the end of the year, which would add $90,000 more to the full cost of a home loan in Seattle, based on today’s prices.